NFL Forum :: - What's On Your Bears Gameday/Tailgate Playlist? What's On Your Bears Gameday/Tailgate Playlist? Posted: Wed Oct 17, 2012 12:53 am Post subject: What's On Your Bears Gameday/Tailgate Playlist? *Rise Against - Chamber the Cartridge has been the first song for me for a few years now, great choice to start it off with by a Chicago band. *Jim Croce - Bad Bad Leroy Brown is a new one for me. Remember, Leroy Brown is from the south side of Chicago, the baddest part of town. *Social Distortion - Ring of Fire, just a great cover, and you can't go wrong with Social D.
*Adam Sandler - The Lonesome Kicker has been in my playlist for years now. Such an underrated song. Ted Nugent - Stranglehold is another one I can't seem to get rid of. Great song for slowing it down but staying heavy. The Hives - Return the Favor is in there because it's the Bears TD song... I think they were hoping it would catch on like Chelsea Dagger did with the Hawks. I still like it better than For Whom The Bell Tolls, which got really old. Led Zeppelin - Rock and Roll made it into my playlist this year. Wish I had added this one previously. Social Distortion - Reach for the Sky, second year I've had this one in on gameday, great late-in-the-playlist song. I also have numerous radio calls and quotes intermixed in the playlist. For this MNF game? The Bolero by Ravel. Chicago doesnt know wings. Buffalo knows wings and beer, thats about it. Buffalo doesn't know football. Please, what does Buffalo know about wings? 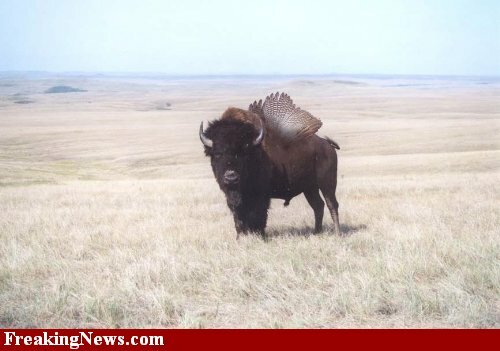 I thought I killed the last winged buffalo. I need to step up my man game. You should put the winged buffalo in your sig. There's nothing scarier than a winged buffalo.